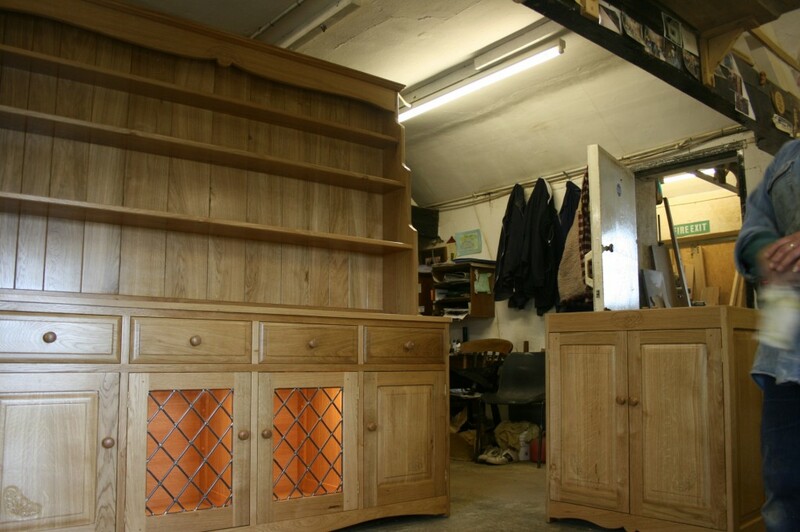 Over the years we have taken great pleasure in creating many dressers and sideboards for customers throughout Great Britain. We are able to offer a completely bespoke service, giving you the chance to fit a piece of furniture exactly to the space you have available. We don’t have a standard design but in this section you can see examples of previous cabinets with brief descriptions and guide prices. 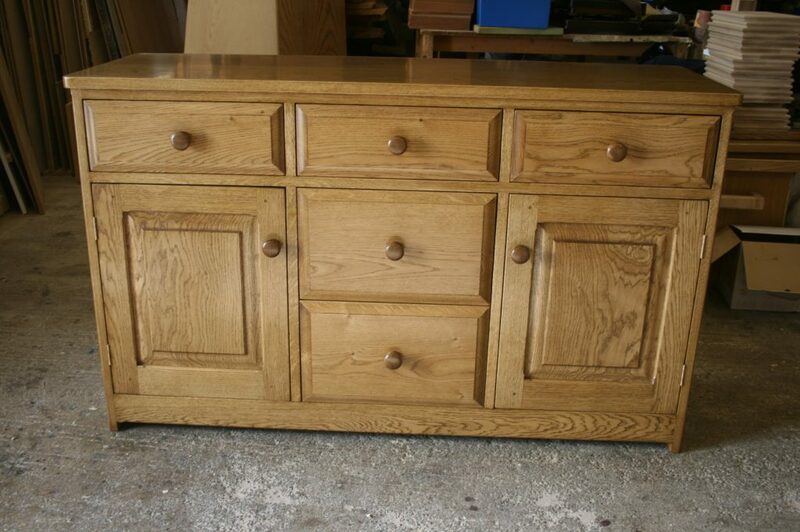 This was one of our largest dressers, in medium oak, measuring 78” x 78” with 4 equal doors and drawers in the base. This one is quite unusual, having a combination of solid doors and open shelving at the top. Current guide price £4995. 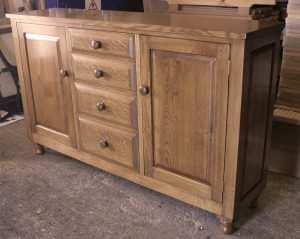 Medium oak sideboard with wine rack. 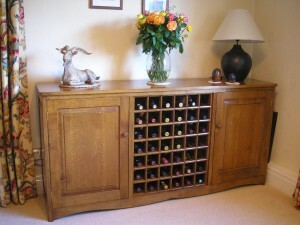 Made for the same customer was this attractive and practical sideboard with a built in 42 bottle wine rack. The side cupboards have two fixed shelves each. 72”l x 35”h x 21”d. Current guide price £3,150. 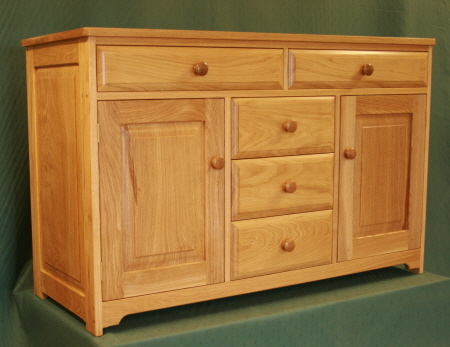 Elm cabinets were our staple diet at one time but have almost completely gone from our range now. 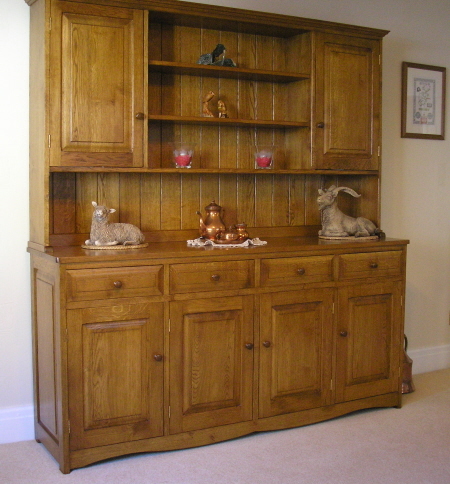 This natural elm dresser was made for a customer who already owned a number of our earlier items in English elm. No English elm was available so American red elm is the closest match. I know this isn’t officially a Dresser or sideboard but it still sneaks into this section as it works like a dresser but neatly tucked away in the corner! 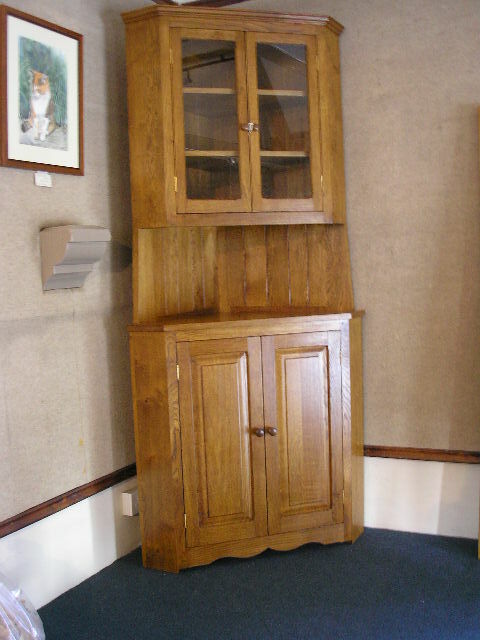 Medium oak tall corner cabinet. This is a fairly large one, being full height, 78”, and having two doors both top and bottom. The base measures 24” along each side from the back corner. We can vary this design in many ways, larger, smaller, single doors, bevelled glass, leaded glass etc. Guide price for this one in medium oak is £2,400. 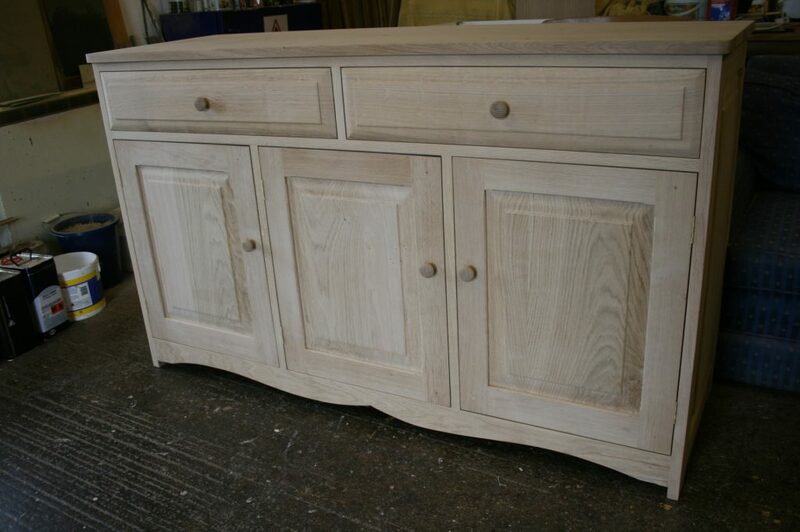 Options for designs of sideboards and dressers are almost endless, which is one of the main reasons for commissioning a piece from us. You can fit a cabinet exactly to the available space with storage layout to suit your needs. This 54” sideboard has two deep drawers instead of the more usual three, indicating how designs can be adapted to your personal requirements. 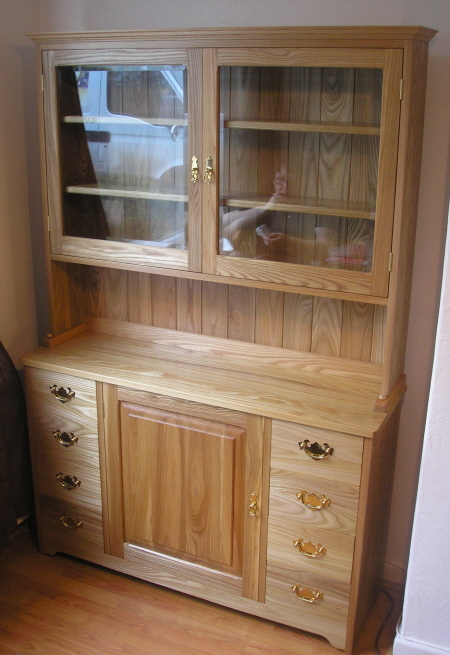 Finished in light oak the guide price is £2,600. 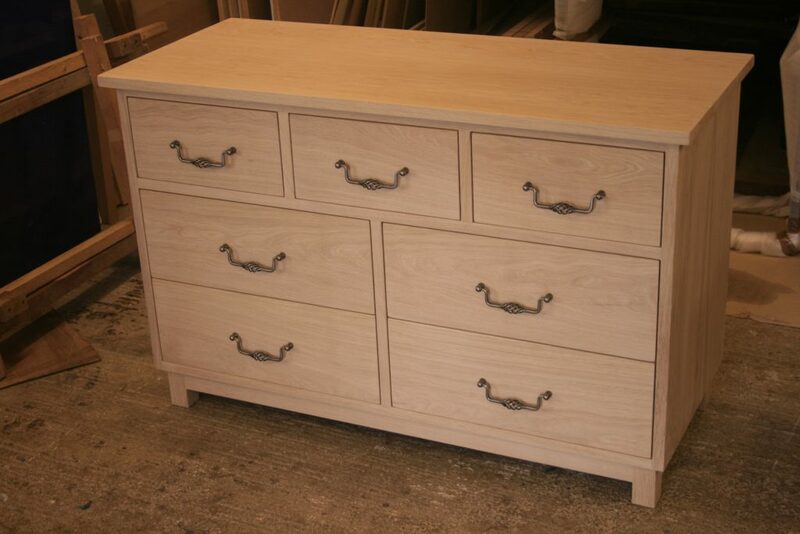 Here is another variation with two top drawers and a central run of three equal drawers. Finished in natural oak dimensions and price are same as the previous cabinet. Homes come in all shapes and sizes, which means we need to make cabinets to fit. This Victorian oak example is narrower than most at 15” deep, 60” long and 35” high, price guide, £2750. We are always proud of the pieces we create, but this one was more perfect tham most! The customer asked for a simple, clean design, created with flat sides and drawer fronts. Rory spent a lot of time ensuring that the grain matched from top to bottm as well as from side to side, and also put a huge amount of effort getting all the fit lines perfect, which is a considerable achievement with so many drawers to line up. The result, I’m sure you would agree, is spectacular.